If you knew me very well, you would never dream I would have waited this late to post another blog...since I talk all the time. But, that is probably why. I have been so busy talking with women in all areas of the country and coming up with solutions to their beauty frustrations. Now I need to blog about it. We just sent out our summer Newsletter, so if you didn't get it, go to my web site, christiharris.com. I will be posting more videos that I know will help you resolve some problems you may have on a day-to-day basis with your skin, makeup, hair and brows. Let me hear from you, as well. Through my network of professionals in my field I have recently been introduced to Shelly Beatty owner of the Stylemaker Salon in Fort Worth, Texas. I have visited the salon and I must say this lady knows her stuff! 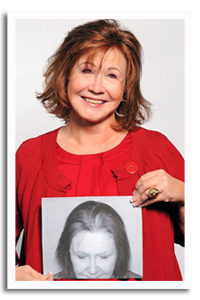 She will tell you the truth about thinning hair, hair replacement, extensions and is able to back up her promises. I was amazed with the results she has had. The before and afters speak for themselves. She is an amazing woman that I just had to interview and share her story with all of you. I asked Shelly to share with me her background and I asked her 8 questions everyone needs to know. Chicks share this info with your husbands and friends who may be experiencing thinning hair. I would certainly go for a consultation if you are frustrated. She has clients from all over the U.S. who are happy with hair now. With nearly 30 years of industry experience, Shelly Beatty is the President of Stylemakers Inc. She began Stylemakers in 1991 after a decade of experience in hair design and styling and now works one-on-one with clients every day who are suffering with various degrees of hair loss. Her extensive clientele includes many of Fort Worth's elite, and they appreciate her vast training, experience, caring personality and attention to detail. Shelly has won numerous awards for her excellence and has been sought after by media as a salon industry expert in working with cancer patients, hair thinning and hair loss. Shelly's success - as a stylist and a business owner - is due in large part to her deep and genuine care for her clients. She understands the intense relationship between a person's hair and their self-image. That's why she has worked extensively to bring the highest quality Hair Replacement options and Laser Hair Therapy technology to Fort Worth and now specializes in working with men and women who suffer all forms of hair loss and balding. Shelly trains monthly and extensively with the Specialty Physicians from the Hair loss Control Clinic in New York, New York and with other Hair Restoration Industry leaders in order to understand the causes of hair loss and to offer insight for clients who are seeking answers. 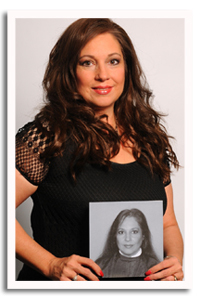 Shelly is able to fully explain the causes of hair loss and offer direction to clients who are seeking hair recovery. During an in depth Hair Loss Exam, she will examine the client's hair follicle at a 200X magnification in order to show the client what is happening at the follicular level of the hair. With this information, she can determine what is causing the hair loss and offer the best options for the client. Can Hair Loss be stopped and/or reversed? Shelly Beatty: At this time there is no cure for baldness. However, it has been proven that hair loss can be stopped and/or reversed with Laser Hair Therapy (LHT) but only if the hair loss is caught before the follicles go completely dormant (bald). Once the follicles have been dormant for 5 years or more there is still the opportunity to stop the loss but very little chance of regaining hair. The best time to address hair loss with LHT is within 1-3 years of experiencing the hair loss onset. What is the best way to make thin hair look fuller? 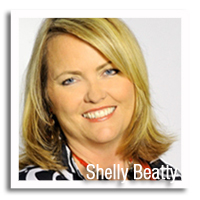 Shelly Beatty: If you want an instant "lift" to the hair, use a root lift product on the base area of the hair. Then style your hair with a large round brush to add fullness. Always use an IONIC blow dryer as well. This will make the process of drying your fine hair less damaging since fine hair is much more sensitive to heat damage. If you want more of a permanent solution to thin hair, utilize LHT to strengthen and thicken your hair. This will take a little time...approximately 3-6 months. And lastly you could add Micro-Point extensions to add more hair instantly. These extensions are very fine and lightweight and therefore will not damage the clients own hair. You can use extensions to add thickness and fullness in addition to making hair longer. Always use a CERTIFIED EXTENSION SPECIALIST when applying extensions. If hair is really thin, especially on top, should you try Rogaine? Shelly Beatty: The FDA has only approved two treatments for the condition of hair loss: Rogaine (Minoxidil) and Laser Hair Therapy (LHT). We suggest Minoxidil when the hair loss has been occurring for more than 5 years and there is an actual missing area of hair. Minoxidil is a lifelong commitment. Once you start using it you should never stop or you may lose the vast majority of the hair it stimulated to regrow. We recommend using LHT to actually repair the dormant follicles which have stopped producing hair. LHT does not have any negative effects and many times can reverse the hair loss issue and correct the follicle long term. If hair has been thinning for more than 10 years, should you do a hair transplant? Shelly Beatty: Women are rarely candidates for hair transplantation because their loss is typically diffused and will continue to worsen. Therefore at some point the transplant would have to be redone. Men typically do better with transplants because they have entire areas of missing hair. However, be aware that if when transplants are performed, if hair is currently present in the transplant area, that hair will continue to experience loss thus resulting in additional transplants procedures. Shelly Beatty: YES! When the body is under duress it creates a larger amount of testosterone which then gets converted to DHT (dihydrotestosterone). The androgen receptors at the base of the hair follicles are very sensitive to DHT. When too much DHT is present it binds onto the androgen receptors. This causes shrinking of the hair follicles and prohibits new hair growth. This is the largest cause of hair loss. Determine if you have this first by having a hair loss exam and then use a recommended DHT blocker to protect your androgen receptors which are located at the base of your hair follicles. Shelly Beatty: Many times it can simply because hormone levels are not as they should be. It is suggested that women have their hormones checked and if the hormones are "off" seek advice from your physician to correct them. If you have Alopecia and have patches of missing hair, what else is out there besides just wearing a wig? Shelly Beatty: Wearing a wig definitely gives you an instant "fix". However, it is not very conducive to an active lifestyle. We suggest a complete hair transformation with Natural Advantage. This hair replacement service is amazing and beautiful. It will give you back your lifestyle and confidence as your new hair is attached and will not come off until we take it off. You can shower, swim and sleep with your new hair without worry of it ever coming off. It simply becomes a part of you! How do you find a hairpiece that looks natural? Shelly Beatty: The best way to get a completely natural look with a hair piece is to have one custom made just for you. At Stylemakers a professional hair replacement specialist can design a hair piece that will blend right in to your own hair. When done correctly, no one will be able to tell you are wearing one. Here's a fun fact: Many people in the movies and TV wear hair pieces that are designed by the pros. But since they look so natural you will never know! or check out her website at stylemakersalon.com. She is our December giveaway winner. She will be receiving $300 in product from my website www.christiharris.com. Everyone stay updated on my posts and future giveaways. I'll be doing some really great interviews with very inspirational women that we can learn so much from and the conversation is always open to all.